"Plants are subject to attack by an onslaught of microbes and herbivores, yet are able to specifically perceive the threat and mount appropriate defenses," said Gary W. Felton, professor and head of entomology. "But, herbivores can evade plant defenses by using symbiotic bacteria that deceive the plant into perceiving an herbivore threat as microbial, suppressing the plant's defenses against herbivores." Felton's research looked at two crop pests -- tomato fruit worms and the Colorado potato beetle -- plant reactions to the pests, and the microbes that they carry. He presented his findings (Feb 18) at the annual meeting of the American Association for the Advancement of Science in Boston. This broad look at herbivore-plant interactions takes into account the entire phytobiome -- the plants, their environment, their predators and the organisms that colonize them. 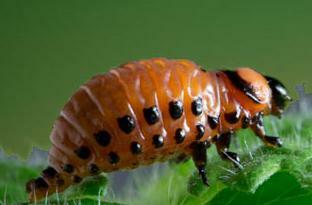 Immature Colorado potato beetle larvae on a leaf is shown. Tomato fruit worms may be the most important crop pest in North and South America. According to Felton, the caterpillar enjoys eating more than 100 different agricultural crops. Unfortunately, it likes to eat what we eat. The Colorado potato beetle moved quickly across the U.S. from Mexico in the mid-1800s and took only 20 to 30 years to reach New York and Long Island. It strips leaves down to the veins, leaving skeletal remains. Plants have two lines of defense against these predators. One reaction, regulated by jasmonic acid, comes into play when insects chew on the plant's leaves, stems or fruit, damaging the plant and leaving insect saliva. The other is turned on when an insect regurgitates stomach contents containing microbes onto the plant triggering a response by the plant to microbial pathogens that uses salicylic acid. When microbes -- viruses and bacteria -- are symbiotic companion of the insects, these pathways can be interrupted. "Parasitoids (predatory insects) inject eggs into the caterpillar and the developing parasitoid eventually kills the caterpillar," said Felton. "Along with the eggs, the parasitoid injects a symbiotic virus that knocks out the immune system of the caterpillar and kill the component in the caterpillar saliva that signals the plant that it is being attacked." When a parasitoid-infected tomato fruit worm attacks a plant, the plant does not realize the caterpillar is chewing on it, none of the chemical defense systems in the plant activate. This benefits the caterpillar and the symbiotic microbe, but does not do much for the plant. When the Colorado potato beetle -- which likes potato plants, but will eat all the plants in the nightshade family -- regurgitates its stomach contents onto a leaf, the bacteria from the beetle's gut triggers the plant's microbial response, but turns off the plant's response to chewing. The bacteria are able to spread and the herbivore, the beetle, gets to strip the leaves without encountering the plant's chemical response. The Colorado potato beetle has gone through whole sequences of insecticides and developed resistance. "More than two decades ago, neonicotinoids became widely used against the beetles, and that worked," said Felton. "But they may be losing their effect." The Colorado potato beetle suppresses the plants chewing response only when the beetles feed on tomatoes or potatoes, not when they feed on other members of the nightshade family like eggplants or peppers. The symbiotic bacteria only develop in the beetle gut when feeding on tomatoes and potatoes. Understanding the interaction between plants, their predators and the microbes that live in them, may help researchers understand how to control these pests. "When we know more about all these microbe, herbivore, and plant interactions, we may be able to manipulate the system to make the plants manipulate the bacteria," said Felton. "Probiotics (mixes of specific bacteria or viruses) could alter the gut microbiome to benefit the plant." Some microbes turn on the plants, increasing growth and enhancing the defensive systems, according to Felton. Some caterpillar bacteria seem to make some seeds germinate faster. "Lots of companies are investing in beneficial natural plant microbes," said Felton. "This could improve plant productivity.